If a bone breaks and the pieces, or fragments, are in the same position as they were before the fracture happened, there is no displacement. Displacement occurs if those two pieces move away from each other. It is significant when the fragments move out of their anatomical position. Joints form when two bones articulate with each other. Articular fractures occur when there is a break in the bone at the surface of the joint. Patients often have less than desirable results if an articular fracture is treated non-operatively. 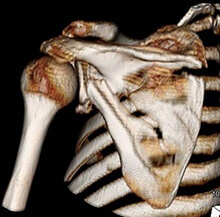 Multiple fractures of the shoulder girdle are unstable. These fractures may not heal properly without surgery to stabilize the fractures. In addition, certain single fracture patterns have been found to have unstable characteristics and may progressively displace without surgical intervention. These fracture types are associated with poor healing and unfavorable outcomes. There is growing evidence that surgery has the potential to improve outcomes. Historically, scapula fractures have been treated with a sling for rest, followed by physical therapy once the fracture heals. This conservative method works well for stable fractures with minimal displacement. Unfortunately, research has shown that patients with more severe fractures have been left with less than favorable outcomes as a result of that this conservative treatment model. Malunion is a medical term used to describe a fracture that heals in an abnormal fashion. Malunion following a severe scapula fracture is common, given that nonoperative treatment for scapula fractures is the standard of care. Chronic pain, weakness, and shoulder deformity are recognized and previously reported complications in patients with a scapula malunion. Nerve injury occurs in approximately 10% of scapula fractures. Nerves that supply the rotator cuff muscles can become damaged, which results in shoulder weakness. Often times, an attempt to locate and fix the identified nerve injury will be performed during surgical repair of a scapula fracture. Fractures of the shoulder girdle take anywhere from 6 months to 2 years to completely rehabilitate the bones, joints and supporting musculature. It is important to undergo some type of physical rehabilitation to ensure optimal healing. Finding the best surgical techniques and procedures is a key aspect of our research. There is a growing amount of scientific evidence that shows certain scapula fractures benefit from surgical intervention. We use state of the art 3 dimensional CT reconstruction technology to visualize the fracture and plan the surgery. Open reduction internal fixation is the surgical treatment of choice. This is a process that first restores the normal anatomy of the scapula and then, with the application of plates and screws, the anatomical reduction is fixed throughout healing. The goal of restoring structure is to prevent malunion and improve the pain-free function of the shoulder. This surgery can be performed months after the injury. We are at the forefront of scapula research. Please contact us regarding questions you may have about your unique injury.